Phuentsholing isn't a town that demands extensive stays for tourism puposes... most people who stay here for more than a day are here on business or official work. Phuentsholing doesn’t have the kind of experiential living options that Thimphu, Paro or even Punakha offers. However you will get a range of ultra comfortable hotels (four star) to moderately comfortable hotels (three star) and budget accommodation. Five star hotels do not exist in Phuentsholing but then again they are not needed as its just a transit point. Its recommended to stay over in Phuentsholing for a day (if you are travelling to Bhutan for pleasure by road from India) in order to complete the travel plans, permit procurement process, take some rest and acclimatize yourself for the colder climes of high altitude Bhutan. Another major purpose of Phuentsholing stay over could be shopping... souvenirs and fancy items sold here are at least 20% cheaper than things of equivalent quality sold in Paro and other tourist attractions. All most all Bhutanese acquaintances I met told me that they regularly shopped from Phuentsholing for their lifestyle requirements. Most hotels in Phuentsholing are in the commercial areas i.e. near the Zangtokpelri Park or near the Immigration office. Note: Most three star and lower standard hotels in Phuentsholing do not have lifts so do check before booking online. Most two star and budget hotels will only take cash... however, Phuentsholing has many ATM’s. In case you are an Indian, a useful tip would be to quickly cross the border to Jaigaon and then withdraw money from the ATM there so that you don’t have to pay that 5% surcharge on a foreign debit card while withdrawing money. The Hotel Druk belongs to the Tashi Group (leading business conglomerate of Bhutan) and has another hotel by the same name in Thimphu. The hotel sees a lot of business travellers, diplomats and officials apart from tourists. In peak season its difficult to get availability unless you book at least two months in advance. During off season too, check availability online before you plan your stay. This hotel has been under renovation for a long time (last two years) and has now opened with improved offerings. If you are looking for luxury living in Phuentsholing then Hotel Druk should be your first choice. There are a total of 32 rooms in Hotel Druk and that includes 2 junior suites and one presidential suite. All rooms and the hotel lobby has free wifi. 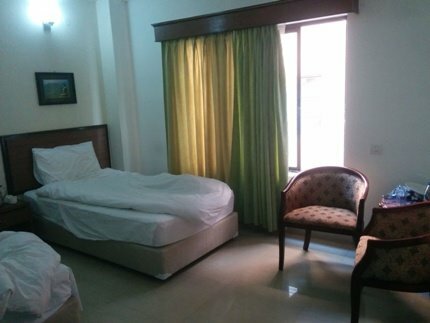 Facilities include air conditioning, huge LCD screens, DVD player, mini bar etc, washrooms with luxury fittings, bath tub and curtained shower area and toiletries hamper along with 24x7 hot water availability. A range of guest services like laundry service, safe (for depositing valuables), business center, conference and meeting room, travel desk and a currency exchange counter are available. The Hotel has an in-house multi cuisine restaurant and bar that serves Indian, Chinese, Continental along with local and international liquor brands. There is a beautiful open air lawn and barbeque facility for the use of guests. The décor is modernistic with subtle Bhutanese elements. 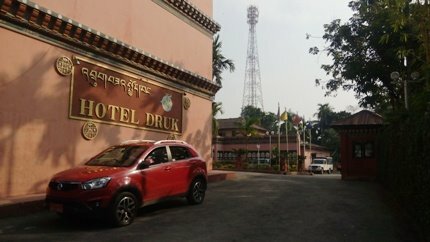 This hotel is 5 km away from the Phuentsholing town near the highway. This is one of the few hotels in Phuentsholing with traditional Bhutanese décor and is a popular choice amongst tourists. Most Hotels in Phuentsholing are a little cramped for space and do not have a sprawling compound (apart from the Druk Hotel). However, the Tashi Namgay resort has a giant sprawling compound which can give you the actual feel of being in a resort. The 100 m rather dubious looking decline to the entrance is a minus point though this part is under renovation. There is free parking and this a huge advantage for those who are driving in from the Indo Bhutan border or have rented their own vehicle. The room rate is about 6000 NU for deluxe rooms plus tax. The corner rooms on the ground floor and first floor have a good view so maybe you could specifically ask for them. The rooms are not very huge and the bed size differs in most of them. Ask specifically for a room with a large bed. Wi Fi is available only in the lobby and its speed is not good. The pool side sit out area is great and the staff provides friendly and helpful service. The Park Hotel is amongst the better accommodation options in Phuentsholing and it has consistently gathered good reviews. I happened to stay in the Park Hotel for a day during my exit from Bhutan and had a reasonably pleasant experience there. The location of the hotel is good…its situated in the heart of the city and yet manages to cultivate a fair share of greenery around, thanks to the Feng Shui fountain at the entrance. 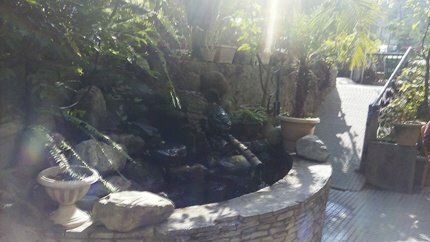 Their outside seating area (beside the fountain) is small but very pretty. The hotel entrance is on the first floor of a building and the ground floor has plenty of good shops of apparels, bags and accessories. There are 3 categories of rooms here; standard, deluxe and Park premium Bhutan. I had opted for the standard room and it cost me 2600 NU with taxes (post bargaining and in off season). The deluxe room is 4000 NU and the Park Premium is 7000 NU. The room was unimpressive... I anyway wanted just a passable option to spend the night but there were faint stains on the wall which was a major turn off. The washroom was however good and geyser, shower, taps all worked fine. The standard rooms are a bit stuffy and the pictures given on the hotel’s website are a little airbrushed. However, the lobby, reception, dining area, bar all look great. Park Premium suites seem to be nice. The Bar deserves special mention... it had an impressive collection of international brands and it was dimly lit with a pleasant ambience. The restaurant 'The Park Restaurant' offers set meals (different varieties) on different days of the week along with a-la-carte items. I had just ordered chicken Biryani (room service) one day and it was quite average. The highlight of my stay there was that there was a lady at the counter who let me make 3 free calls to India (short duration) as I had to hurriedly call my agent for confirming my tickets. This is especially mentionable as there was another lady (she works in the night shift) who kept on insisting that the hotel rate for calling India was 30 NU per minute. During my stay, I saw the national football team of Bhutan staying in the hotel... this speaks well about the hotel’s popularity. There are a variety of passwords for the Wi Fi and it doesn’t always work. However, the staff was prompt to respond on my complaints. We overstayed at the Park Hotel i.e. we packed our luggage and left at the reception before town hopping as there was a 4-hour gap between checkout time and train schedule. The staff was nice enough to let us use the hotel washrooms and changing rooms even after checkout and arranged an alternative taxi driver for us (ours had failed to turn up) at no extra charge. All together …a pleasant place to stay if you don’t have high expectations. The hotel doesn’t possess fancy facilities like mini bar but there is wi fi and the rooms are quite large. 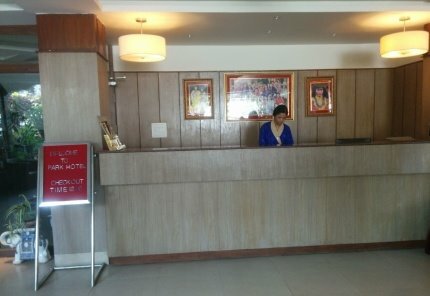 This hotel is just 5 minutes away from the Bhutan immigration office so you can just walk down from the immigration office with your luggage to the hotel gate. This is one of the two star standard hotels in Phuentsholing and is good for those who have budget constraints. For those who like Indian food, this hotel can be particularly attractive as they serve good quality vegetarian and non-vegetarian curries, parathas and biryani. Liquor is also available at low rates in the hotel. The staff is very helpful and they arrange tours, guides, taxis and even sim cards for guests. If you are lucky you might even get free pick up and drop. It will take you 3 to 4mins to walk down to Hotel Lhakhi from the immigration office. This is one of the three star hotels in Phuentsholing with better reviews. From the convenience point of view, this hotel is a better option if you are planning for just an overnight stay post entry or pre-exit. There is a total of 32 rooms in the hotel. Most rooms in the hotel do not have a good view. However, the south facing rooms have a pleasant view overlooking the town and greenery. You can specifically ask for a south facing room. Some of the rooms have a basic bath tub. Do specify that you need a room with a bath tub if you want one. Most rooms have twin beds and if you want a double bed room you must specially ask for one. This is a budget hotel so the amenities are quite basic. The rooms are spacious and are reasonably clean. Most washrooms do not have an exhaust fan which is a major issue. The rooms on the third floor have somewhat better facilities. There is Wi-Fi in the hotel and it has decent speed. There is a parking lot and that’s convenient for people who are driving in to Phuentsholing. There is also a beauty salon with spa facilities that’s available for the use of guests. 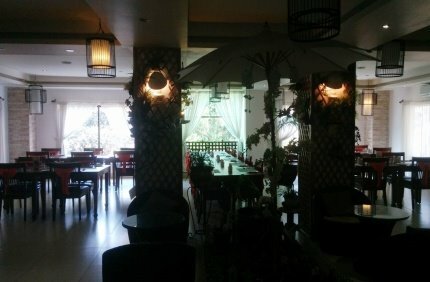 There is an in-house restaurant that serves good Indian, Chinese and continental food. The staff is well behaved and friendly. Ladies in the reception area are smartly dressed in national dress. Rooms are sound proofed so you do not get to hear too much outside noise. The rent for standard room is 3000 NU and for deluxe room is 4500 NU. You can bargain to lower the rates during off season. There is a business center with conference facilities, printer, copier and white board projector in the hotel so it can be used for a business trip as well. This is a decent budget hotel in the outskirts of Phuentsholing. Because of its location, you will be spared of some of the early morning noise that is an integral part of a border town. The rooms are quite cheap (by Bhutan standards) and cost only 1425 NU (standard) and 1700 NU (deluxe, double). This hotel does not have Wi Fi (most of the time it’s not working) but at this price such facilities can’t really be expected. The room size is good though the housekeeping staff do not work with very high standards. It’s possible that you might find sheets unchanged when you walk in. do be vocal about your needs and expectations if you check in here. The rooms have basic amenities like a mid-sized TV, bed, desk and Chair and a smallish wardrobe. Do not choose to stay on the upper floors if you have a problem with climbing stairs. The Bhutan Residence does not have a lift and the stairs are quite steep. Room service is available and the food is decent. Mostly you will get Indian and Bhutanese items so do not expect fancy fare. Service is a bit slow and you must order food early (this is the norm all over Bhutan). True to its name, the Central Hotel is in the center of Phuentsholing. This means that you have easy access to restaurants, bars and shopping complexes. This also means that it will be a noisy stay. Some of the rooms in Central Hotel do have good view overlooking the Park. Most of the rooms are quite tiny and have very basic amenities. Cleanliness standards are not superior but if you have an issue, the staff are helpful enough to have it sorted immediately. The single rooms are undesirable so do opt for a double room even if you are travelling solo. The reception remains closed from 9 p.m. to 10 a.m. and the bill for checkout must be prepared before 10 p.m. the previous night if you are checking out early morning. There is no lift. The hotel main gate closes at 9 p.m. so you must enter through a back entrance if you are late. There is an in-house restaurant but it has dubious reviews and there are plenty of good restaurants around. The room rent is around 1500 NU and is open to negotiation. Do check facilities carefully before checking in.